Bullying and resilience. They are topics that are garnering more and more weight in the world of education each year. And, as gut-wrenching as it is, the calls for action against bullying and violence are loudest from those who have lost the most. Here in Australia the parents of Dolly Everett come quickly to mind, their daughter having taken her own life to escape relentless bullying. This Friday 16 March is Australia’s National Day of Action Against Bullying and Violence. It’s a day that forces us, not only to face these confronting issues head on, but to take action. 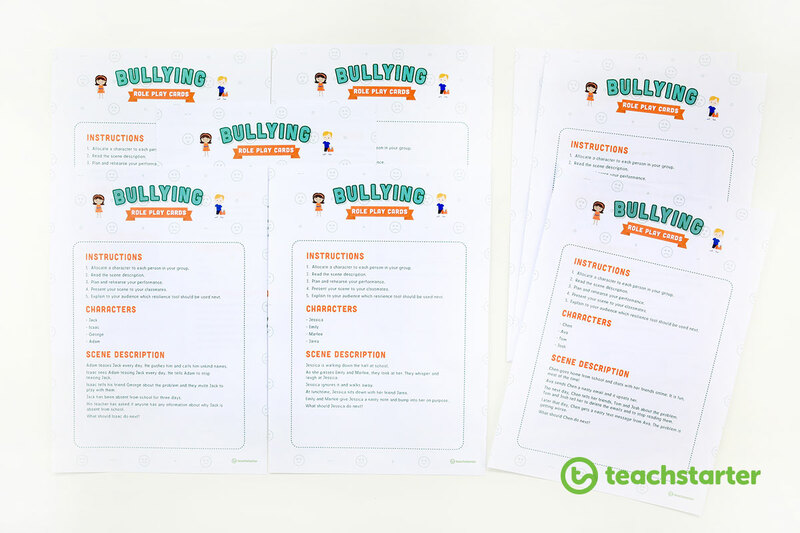 Here we’ve collated ideas, activities and resources you can use in your classroom to educate your students about bullying. We’re going to go straight to what we believe are the most important things for teachers to consider in their approach to bullying and resilience education. Frequency and depth. Teach anti-bullying lessons often and in a way that truly ‘sticks’. 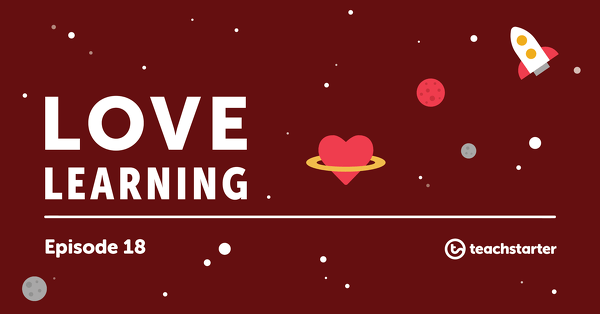 Rather than doing one or two classroom activities when a national day calls for it, we want to help you find ways to engage your students in ongoing conversation, providing important lessons on a regular basis. 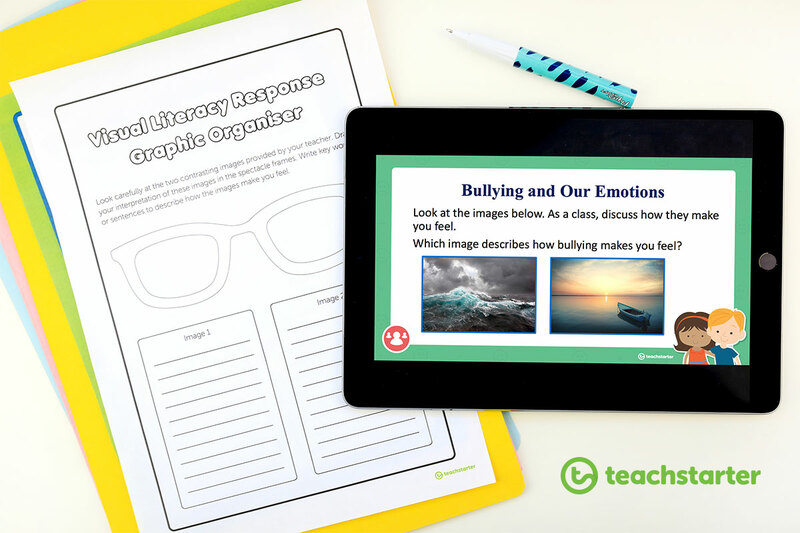 Each of the activities below can become a part of your lesson planning, and will hopefully spark even more ideas for how you can incorporate bullying and resilience lessons into your students’ experiences every week. 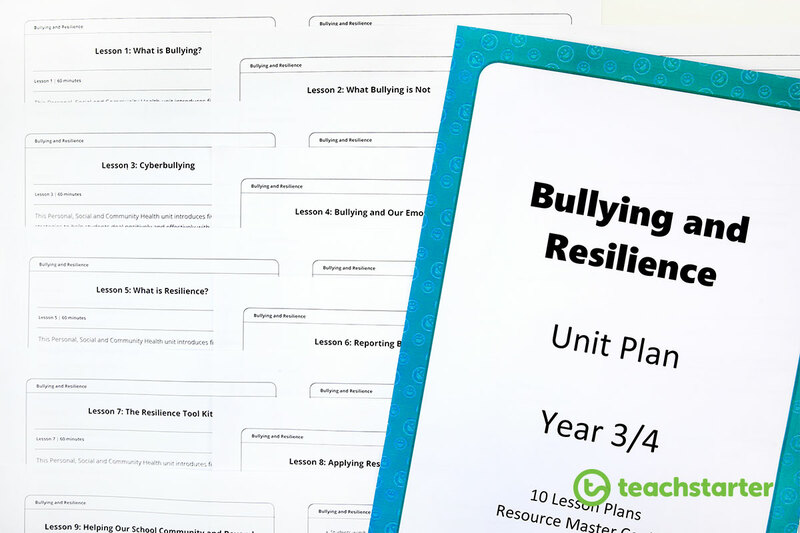 This new Bullying and Resilience Unit Plan is one fantastic way to make these important conversations a regular occurrence in your classroom. This unit plan is written with Year 3 and Year 4 students in mind, however, I urge you to download it and take a look for there are many lesson ideas, activities and resources that are just as suitable for upper grades too. To identify the key traits of bullying. To identify what bullying is not. To identify what cyberbullying is. To identify different emotions and how bullying can make a person feel. To identify and understand emotional resilience. To identify the importance of reporting bullying and who to report to. To identify and use the resilience Tool Kit strategies. To identify the best resilience Tool Kit strategy to use in different bullying scenarios. To share the resilience Tool Kit strategies with the school community and beyond. Within this amazing unit are some bullying and resilience teaching resources that stand alone as well. Using these resources independent of the unit allow you to pick and choose the kinds of activities that are most suited to your class. One of the most empowering gifts we can give our students is a concrete understanding of what they can say and do when they are in a situation that makes them feel physically or emotionally uncomfortable or unsafe. 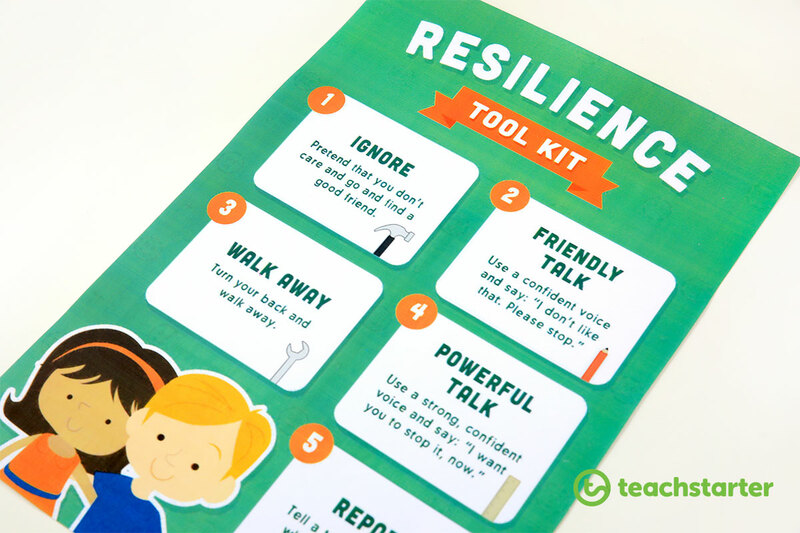 This wonderful Resilience Toolkit Poster with explanations provides actionable strategies that children can understand. However, it’s one thing to talk about these types of bullying awareness and resilience strategies, helping kids feel confident to put them into action requires more than just talk! Which is where these next wonderful practical activity resources come into play. This set of Bullying Role Play Cards allow students to explore bullying situations in a safe environment. You don’t need to be a drama teacher to support students learning through this kind of play acting! What is wonderful about these kinds of activities is that they allow students to physically practise the skills and actions described in the resilience toolkit. This kind of embodied learning builds their resilience muscle memory! ask students to allocate characters and rehearse the role play. Again, while this resource was developed with Year 3 and Year 4 students in mind, the scenarios explored are suitable for older students too! 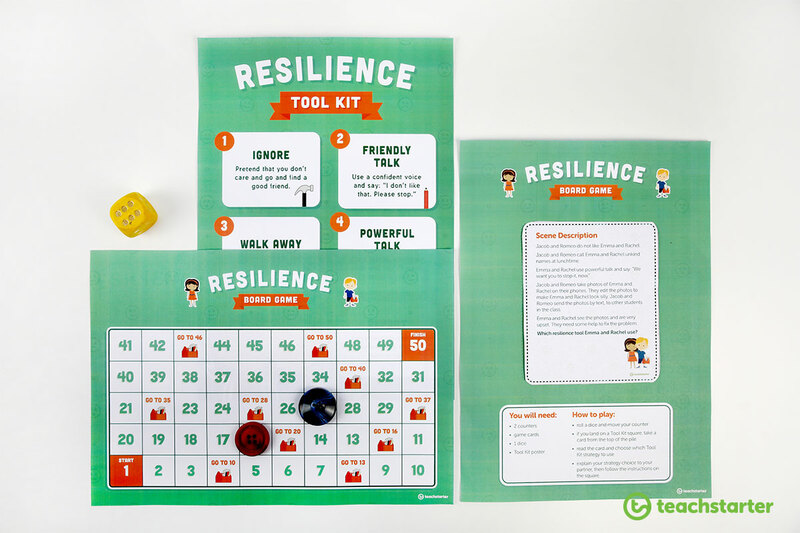 Continue to build your students resilience muscle memory with this Resilience Board Game! Played in pairs, students roll a dice and move their counter the allocated number of squares. They then take a card from the top of the pile if they land on a Tool Kit square and read the scenario on the card. Students then choose which Tool Kit strategy to use to fix the bullying problem, explain their choice and move towards the finish square. 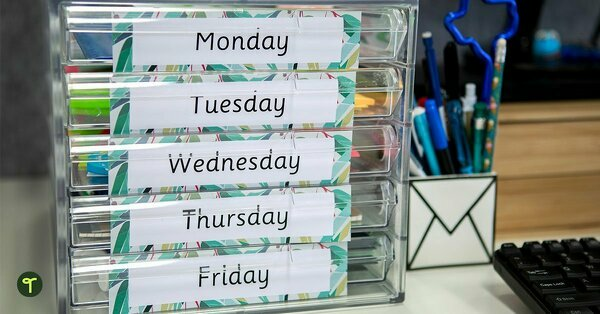 Again, this physical repetition of skill and awareness building works in just the same way we know it does for teaching times tables and sight words. There are also a host of beautiful activities that you can do with your class to help them understand the impacts of bullying behaviours. 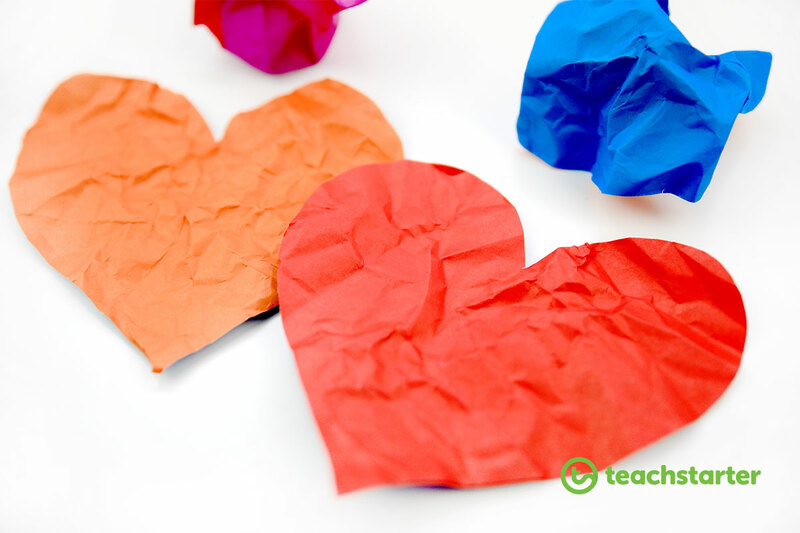 In this activity, students each have a paper heart. They watch or listen to the story of Chrysanthemum, scrunching up the paper when the words spoken to her are unkind and flattening it out when she receives kind words. This powerful lesson has been doing the rounds on social media for a while and definitely deserves a place in your plans for regular learning experiences about bullying. By using a tangible symbol (two apples that look the same on the outside but when cut in half reveal the ‘hurt’ inside), students can easily understand the impact of unkind words. 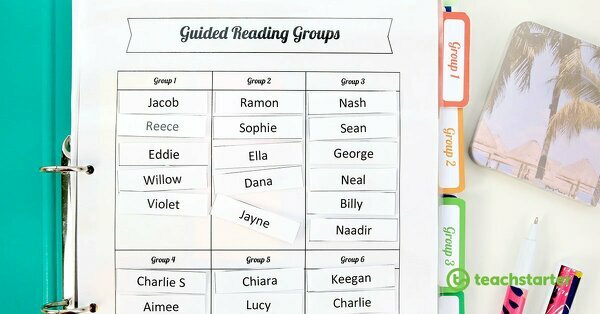 use comprehension activities like our Super Six Comprehension Cubes or QAR Generic Question Cards. This beautiful story was written by primary school teacher Gavin McCormack and illustrated by Jennifer Cooper. “It tells the tale of a lonely penguin who is faced with many hurdles as he grows up. The book has been designed to inspire deep conversations within the classroom and home to educate children about what it feels like to be excluded. It explains how when we are faced with challenges in life, we can overcome them by showing sheer determination and a great deal of care and love” (Are These Your Glasses, 2015). We are excited to be able to provide you with some amazing free downloads to compliment your use of this beautiful book. 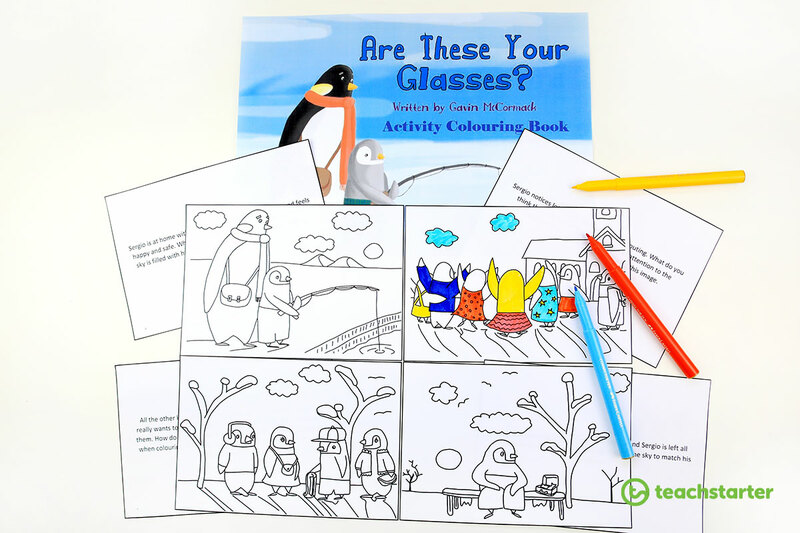 This ‘Are These Your Glasses’ Colouring Book provides black and white illustrations that align with the narrative. Students read the short blurb about each colouring page, and then choose colours to represent the feelings and emotions in each scene. This book contains short stories that are suitable for upper primary and lower high school ages students. 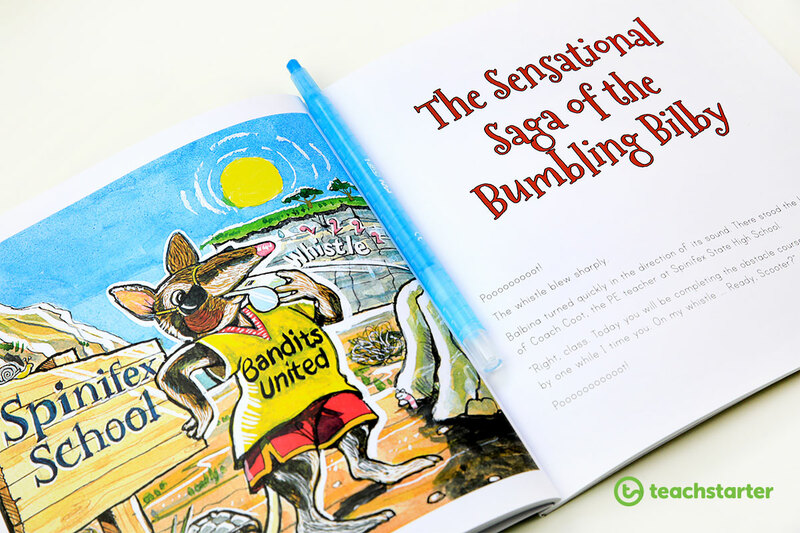 Particularly relevant to the National Day of Action Against Bullying and Violence is ‘The Sensational Saga of the Bumbling Bilby”. 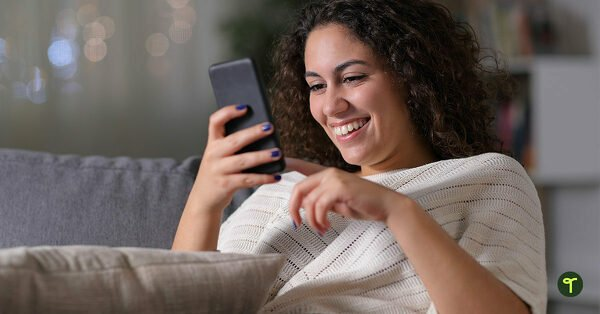 This particular short story examines a cyberbullying situation and contains a page of questions teachers can use to guide student discussion and understanding after reading the text. National Day of Action Against Bullying and Violence is a timely reminder of our responsibility as educators to make space in our students’ learning experiences for bullying and resilience education. Yes, the curriculum is crowded, and yes there are always a million things to do! However, maybe take this moment to think about the kinds of skills and knowledge you want your students to have when they walk out of your classroom for the last time. If kindness, resilience and compassion are on your list then finding ways to incorporate short, regular lessons about bullying and resilience are a crucial part of your planning and practise. 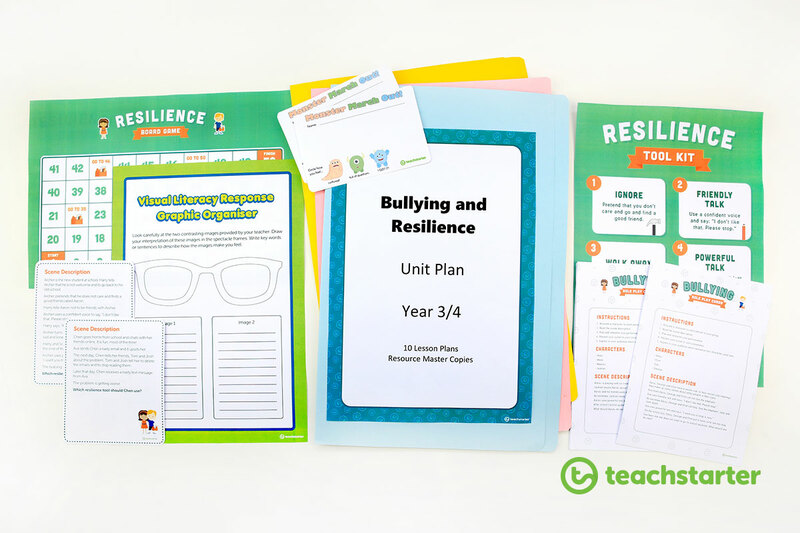 Hopefully, these bullying and resilience activity ideas and teaching resources will go a long way towards ensuring preparation for these lessons is simple, quick and effective! Do you have a favourite classroom activity or lesson to help your students learn about bullying and build their resilience? We’d love you to share in the comments below! I used the book, “The Tweeting Galah’ with my Year 3 class last year during the program on protective behaviours and cyber safety. Many of the children already were aware of and using social media and the messages were relevant at this age. The other 3 stories in the book were also good and generated interesting discussions. This book was also useful in raising the subject in parent conferences as it offers a Family Digital Contract. The best of all is its interactive function, the children loved getting a text message by hovering a phone or ipad over the page and they really engaged with this book and its message. Absolutely! We were excited to learn of “The Tweeting Galah”, especially for use in Australian schools. It certainly is a multi-faceted resource that challenges traditional perceptions of what a book can offer in terms of engagement!